World famous boxing trainer Freddie Roach gives us the routine that's preparing Manny Pacquiao to go toe-to-toe for the fourth time against Juan Manuel Marquez. Prior to his career as one of the elite boxing trainers of his time—working with fighters Manny Pacquiao and Oscar De La Hoya—Freddie Roach was a tough professional fighter with over 50 bouts during his eight-year career. With a final record of 40-13, Roach never held a major title but he also was only knocked out three times. Even later in his career, Roach was known for being able to withstand a lot of combat in the ring. However, his solid conditioning couldn’t prevent the onset of Parkinson’s disease. Today, Roach says the exercise he gets training fighters and all the coordination work he does coaching boxers helps fight the disease’s progression. “In my day, we didn’t have all these different strength and condition coaches. They’re the ones that are bringing steroids into our sport,” Roach says. 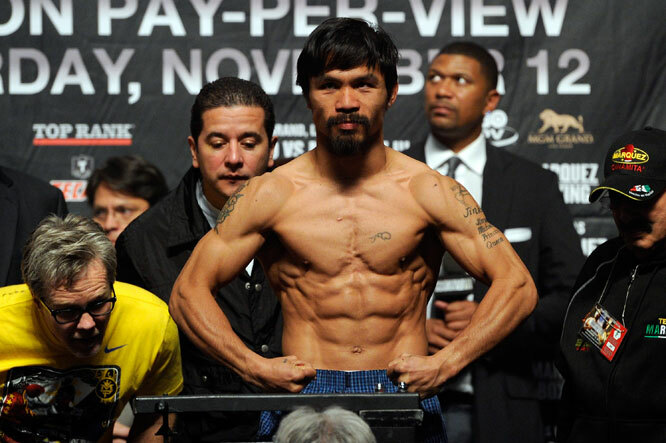 Lately, the focus of Roach’s energy has been preparing for the fourth meeting between Pacquiao and Juan Manuel Marquez. Although Pacquiao bested Marquez in two previous matches, the two fought to a draw in their first encounter in 2004 and to a close, controversial decision for “Pacman” in November 2011. Pacquiao’s workouts last about three hours per day, but he rarely does any weight training, which Roach feels slows down smaller fighters. For that reason, a boxer’s workout is reliant on a variety of calisthenics, with an emphasis on cardio. “When I trained Mickey Rourke to box, we did midnight runs because he is nocturnal, but as long as your body is on a schedule, exercises are going to work,” Roach says.